Remember the Alamo! The defenders fought bravely, to the last man, giving their lives for freedom and the Republic of Texas. But suppose one of those warriors survived the battle? What could he do? Where could he go? He’s suppose to be dead. 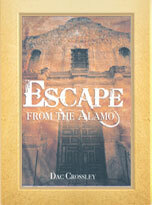 Escape from the Alamo is the story of young George Hanks, an ever-grinning Tennessee lad called “Possum” by Davy Crockett. No longer grinning, Possum finds himself on the battlefield at San Jacinto, wounded, confused and alone. He can’t go back to Tennessee because they believe he died at the Alamo. What’s to become of his idol, Davy Crockett? Possum believes that Crockett must have also survived the Alamo battle, and undertakes to find him in South Texas. Possum’s journey to manhood takes him through fights with Indians and bandits, arrest and trial, and enlistment in the Texas Rangers. Winner of a National Indie Excellence Award!